Nice crag by the lake. Mostly good rock. 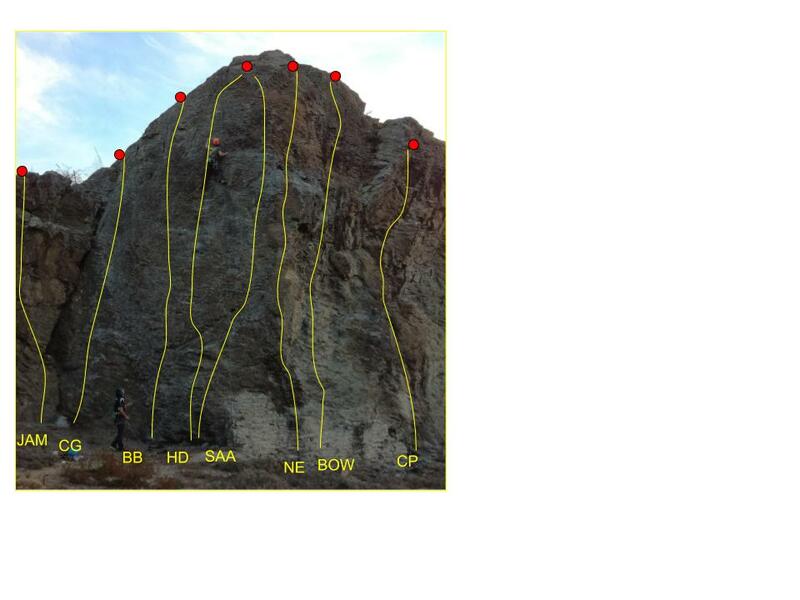 The routes are described from left to right, starting at the small buttress to the left of prominent east facing wall. This wall is shaded by early afternoon and the steeper northeast facing routes are in the shade by 5pm in summer. There is a good swimming hole just a few metres from the base of the crag. Driving from Cromwell to Bannockburn on Bannockburn Road, cross bridge over the Kawarau River, turn left onto Cairnmuir Road. Pull over at first pullout on left and walk down and left to crag. It is easy to walk to either the top of the crag to set up topropes or to the bottom to lead. Tough moves to set up for and mantle the bulge. Pleasant from here up the slab and though the overlap. This route is located on the small buttress beyond the big gum tree. Clip the first bolt from the boulder, this bolt can be used to protect the belayer. Then make your way up the lovely water warn face and desperately establish your self on the slab. From here the climb rears up again to the crux section. A nice technical test. On the small buttress to the left of Chain Gang. Start up the crack which is easily protected then clip the bolt and pull the entertaining mantle. Lower off the chain or walk off the back. Worth a moment of your time. Start to the right of the first bolt. Harder than it looks, especially if you go direct. Nice moves on the upper section. The line with chain link hangers, right of the broken corner with the beehive. If you don't mind the bees they don't mind you. The route climbs well and is a good introduction to the crag. A pleasant route that eases off near the top. Retro bolted (2017) to remove the ground fall potential. Good face climbing with the crux protected by the first bolt. Shares the anchor on the face with ASAA or alternatively you can top out to the old anchor. Left of the prominent arête. Start to the left of the ruins with a rising traverse past the first bolt (please do not start on the ruins). This line is sustained and it will keep you engaged all the way to the top. New anchor with rings on the face or you can top out to the old anchor. Start over the stone wall just right of the arête, then climb the arête proper to the small shelf with a half rest before tackling the crux. Rest at the ledge but keep your head in the game for the final section. Steeper than it looks. Starts a meter right of No Excuses. Climbs the big flake and then directly tackles the upper face. Beware of the grey rock at the bottom of the climb as it is a little friable but improving with traffic. Stiff moves off the ground then up the slopey slab before making a couple of high tension moves to establish your feet on the right leaning ramp. Less jugs than you might like for the gently overhanging finish. On the short but steep wall. Technical moves from start to finish make this an enjoyable route. The rock will continue to clean up with more ascents. Start on the left hand side of toe of the buttress right of Sands of Thyme. This line tackles the narrow face of brown to black rock just left of the arete. Enjoyable climbing on steepening rock with good holds. Keep left of the arete at the top. 18ish if you use the holds on the right of the arete. Nice climbing on the slab at the beach. Negotiate the little bulge at the first bolt and then you're away. Good quality rock. Top roped for years but bolted to lead by Kieran Parsons, 2019. Located on the right hand side of the gully above the beach. A good and consistent route for beginners, or your last climbing before a swim in the river. Grade 15 if you climb it in bare feet. The dirty crack just right of Quick Thyme. The first ascent was on double ropes and made use of the third bolt of the adjacent route. The gear in the middle section should be treated with great caution. Not for the inexperienced trad climber, despite the grade. The obvious right leaning crack and semi detached pillar above the beach. Hand jam or lay back as you burry your big hexes and nuts in this beauty - it can be hard to see all the way into the depths when placing gear. Then slip through the willow leaves onto the tricky upper section with less than satisfying pro. There is a loose but keyed in block at about half height. The first ascent, in good 1975 fashion, was made using only hexes and nuts. A good test of ones head space and not a route to be taken lightly. Anchor 4m back from the edge.